With the lull in new routers while the stuff announced earlier this month at CES is finished up, I've switched the testbed over to testing wireless adapters and bridges. 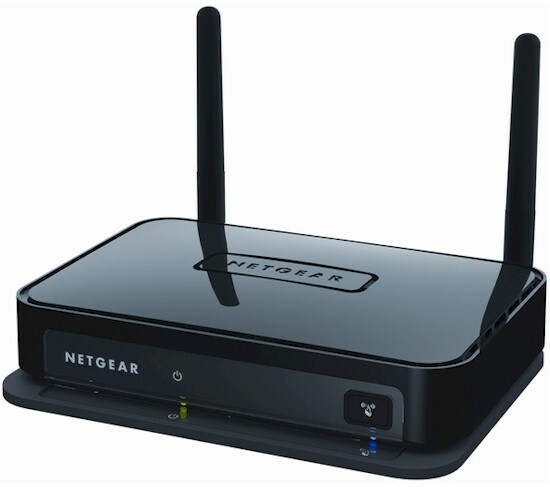 Today, I'm looking at a relatively new entry, NETGEAR's WNCE4004. Since it's always nice to have something to compare to, I also retested ASUS' EA-N66, which was reviewed back in August 2012 using our old process. Why should you care about N900 bridges? Well, just remember that the 2.4 GHz side of AC routers still is an 802.11n radio. And if you have an AC1300 or AC1750 router, that radio is N450 class, just like you'll find in an "N900" bridge. If you're looking to bridge in the 2.4 GHz band, using an "N900" bridge vs. an AC bridge or router can save you a lot of money. In their never-ending quest to put bigger numbers on product packaging, wireless manufacturer marketeers decided to use the same class designation for adapters and bridges used in "equivalent" routers. So an N900 bridge really has a maximum link rate of 450 Mbps in either band. Adapters and bridges never operate simultaneously in both bands. The WNCE4004 is a simple device in that it functions only as a bridge, while the ASUS EA-N66 can also function as an access point and a non-WDS repeater. Where the NETGEAR has a mixed advantage over the ASUS is in its embedded four-port switch. I say mixed because the switch is 10/100 vs. the single Gigabit Ethernet port on the ASUS. The NETGEAR's controls are simple as shown in the callout diagram above. Its approximately 4" x 5" footprint doesn't take up much space and it conveniently has mounting slots on its bottom panel. The FCC ID photos clearly show the Atheros AR9580 3x3 dual-band 802.11abgn radio. But they are not clear enough to clearly make out the main SoC. So I had to open it up and peel off the thermal pad coupling it to its RF cover to identify the 400 MHz Atheros AR7241 Network Processor that is the 4004's heart. The table below compares the key components of the WNCE4004 and ASUS EA-N66. Both make do with dual-band radio SoCs. But since NETGEAR opted to include a four-port switch, they ended up with two SoC's vs. the ASUS' one. If you look carefully at the table and the board photo, you'll see only two SiGE front end modules, but three antennas. This would seem to indicate a 2x3 (two transmit, three receive) design, which would be capable of only a 300 Mbps maximum link rate. But I confirmed that the bridge did connect at 450 Mbps on both bands when connected to an appropriately configured ASUS RT-AC66U.